A simple equation: The more the luggage weighs, the heavier the plane. The more a plane weights, the more fuel it uses, the more carbon emissions your trip produces. Here are some ways to pack less, save the environment, while saving your back! Neutral colors are compatible with almost anything and doesn’t make it seem like you’re repeating clothing. For women, black pants can be versatile for day and night, with just a change of accessories! For men, a neutral colored suit and a change of tie and shirt should be enough for up to five meeting days. Don’t underestimate mix and matching! Tablets are always a good alternative to laptops, if you need to use a laptop during your trip, you could also check for a business center in your accommodation. Another way to bring fewer electronic items is to audit your battery lifespan and understand whether you will need your charger for your trip (don’t forget to fully charge it before leaving). Purchasing the right bag is more important than you think. 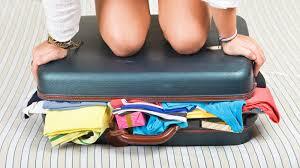 Regular suitcases tend to weight more than 25% of the airline weight limit. By investing in a light weight bag, you will have more space and produce fewer carbon emissions. Pen drives and email attachments should be sufficiently effective nowadays, printed items and bulky folders are a thing of the past. Toiletries are low hanging fruit here- utilize what the hotel gives you, or consider using bar soaps. Check out this complete guide to sustainable hair and skincare when traveling. Remember to keep it light and sustainable!